Prepare your mouth to be hugged! 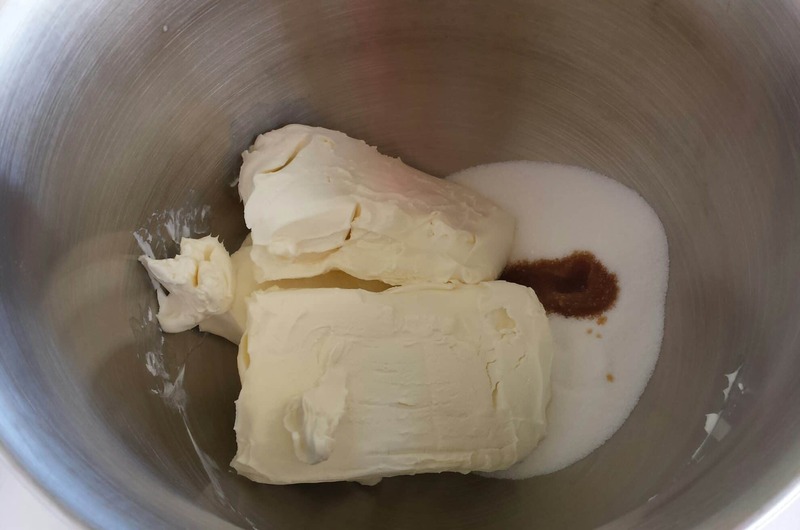 This is the best cheesecake recipe I have tried so far. 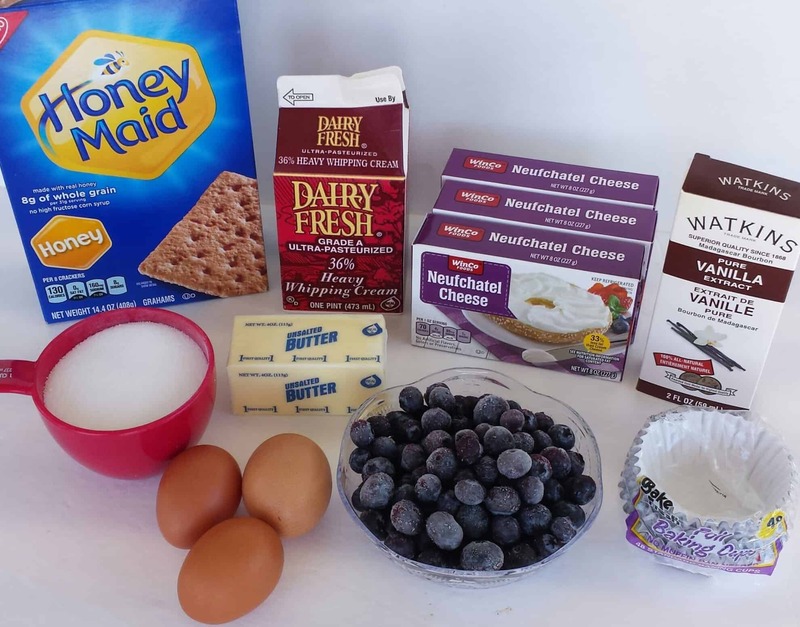 I actually found this recipe on a cream cheese box and wanted to give it a try. It turned out splendid! 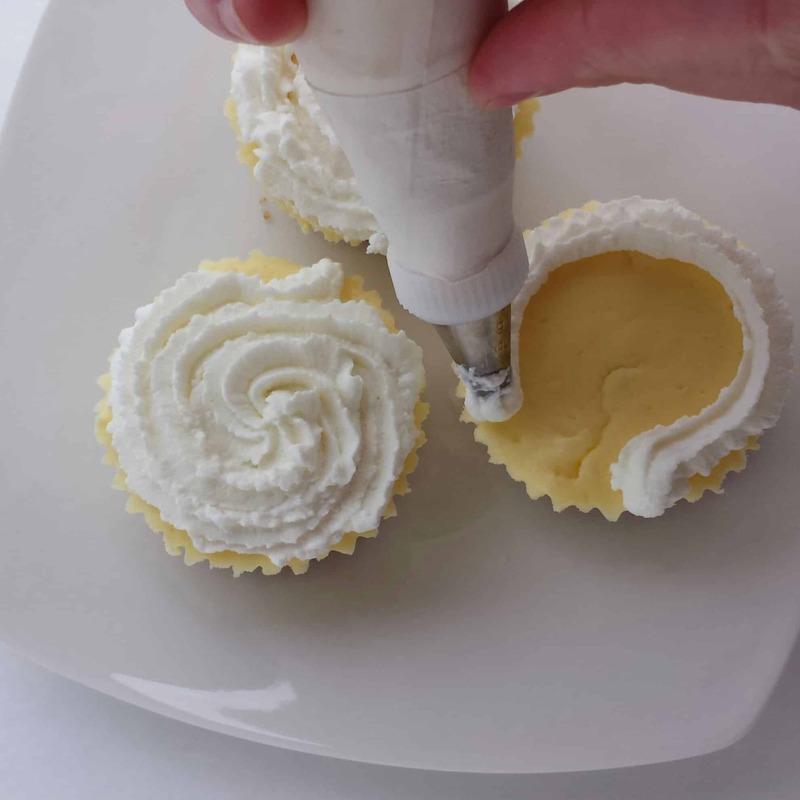 They are super easy to make and have a very smooth texture. 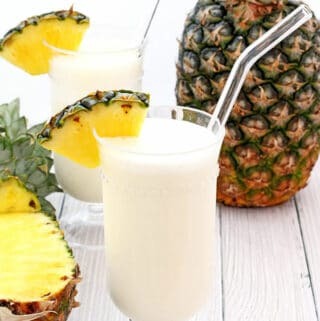 So I decided to share this yummy recipe with you guys. Kids absolutely adored them. 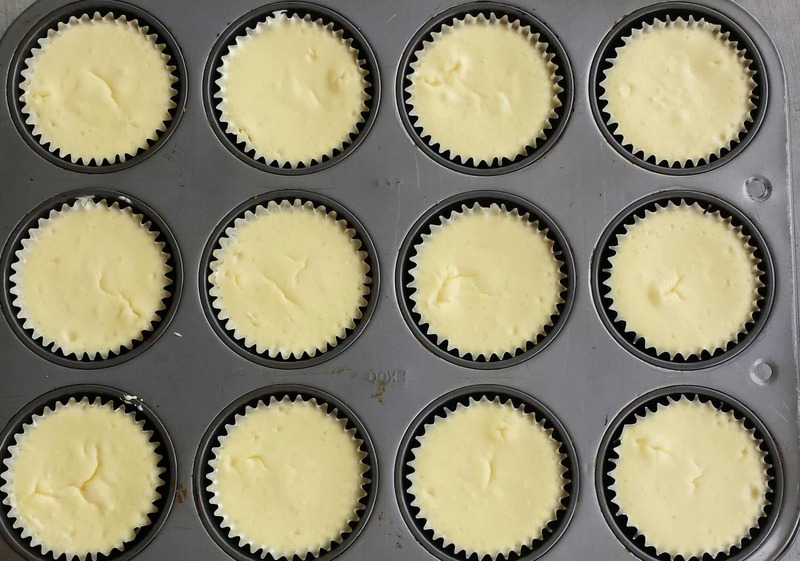 They were asking for more, but this recipe makes only 18 mini cheesecakes so I will be making a double portion next time. They’re so easy for their little hands to hold, and get devoured quicker. 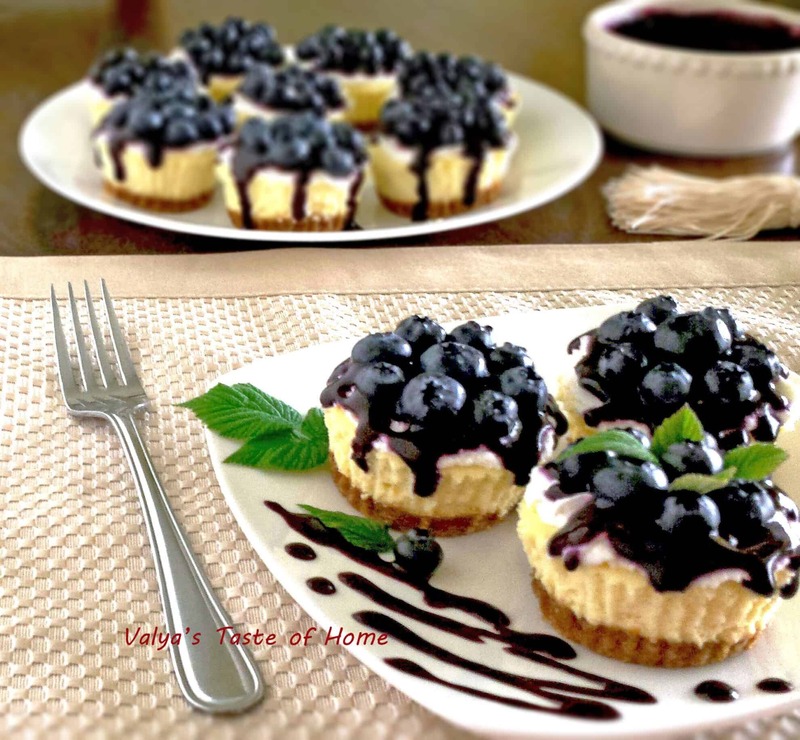 I have used the Blueberry Coulis Sauce that my daughter Elona made to drizzle the top of the mini cheesecakes and placed some fresh farm-picked blueberries that were given by my aunt. Absolutely divine! 1. 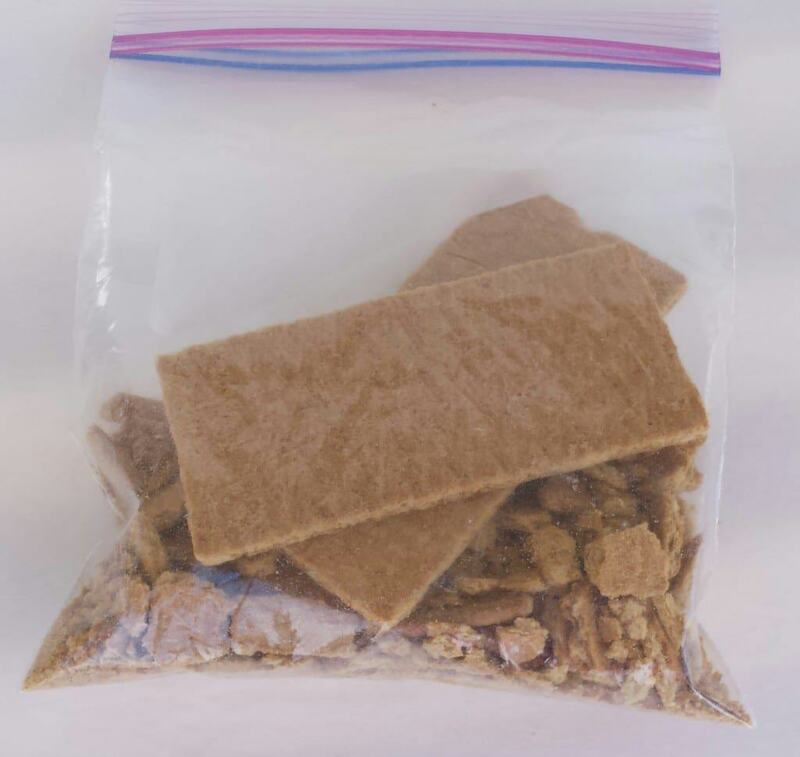 Place 5 whole pieces of graham crackers into a Ziploc bag and crush it with a roller. 2. 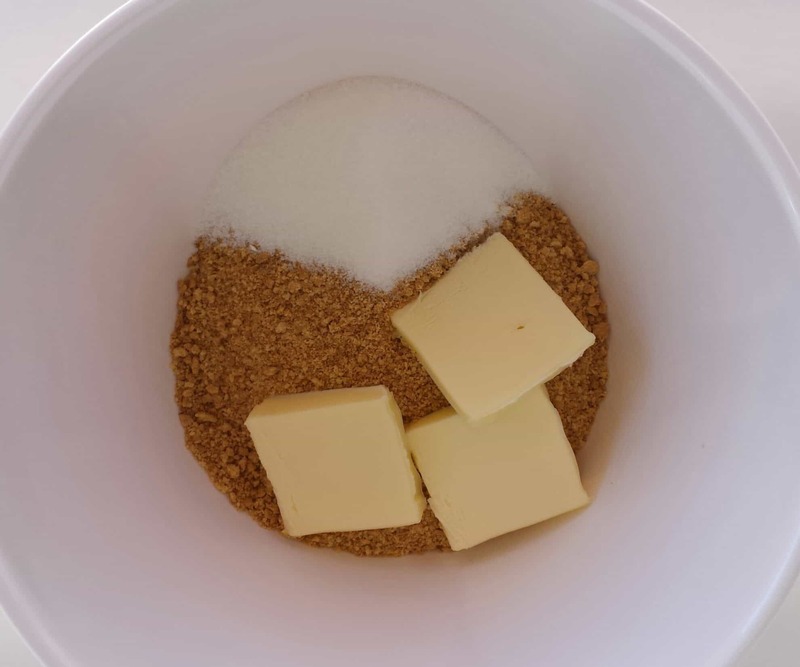 Add graham crackers crumbs, 1 tbsp sugar, and butter into a small bowl. 3. Mix it with a spoon until all combined. 4. 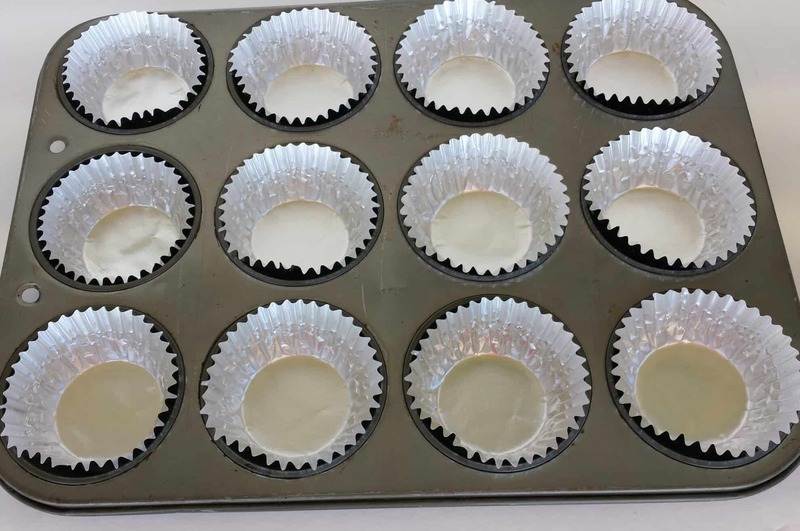 Line muffing pan with aluminum foil liners. 5. 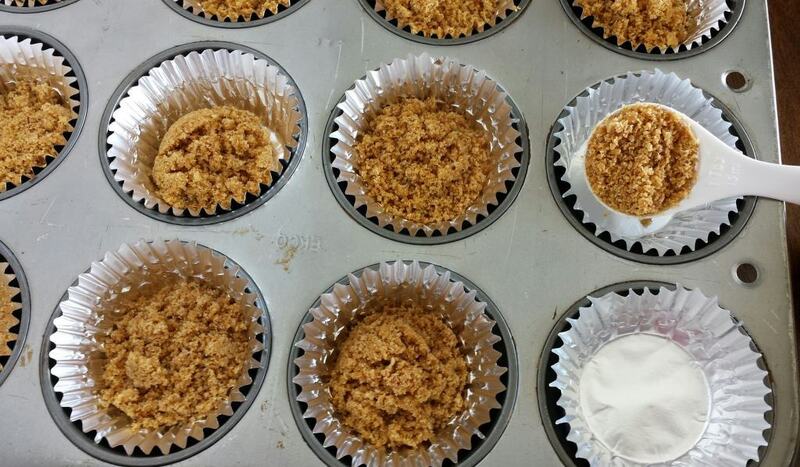 Add 1 tbsp of crumb crust into each liner. 6. 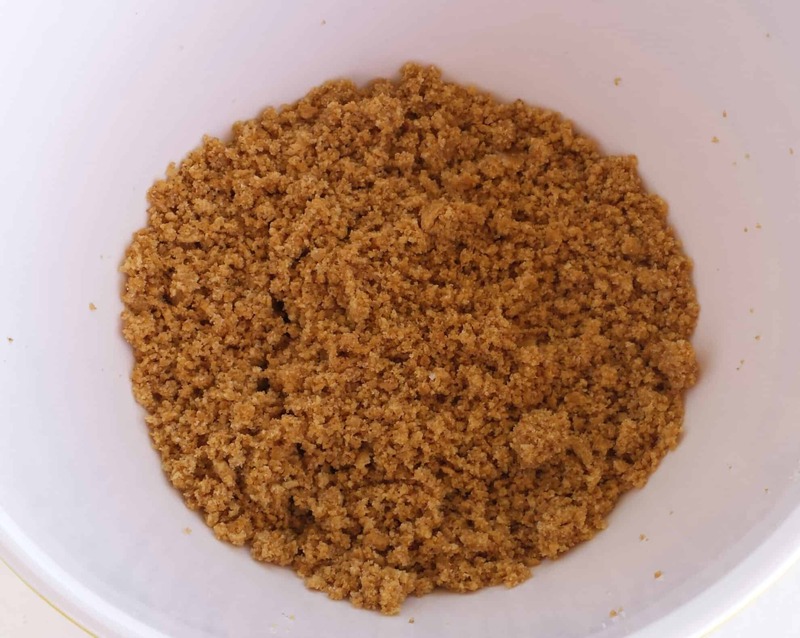 Press down the crumb mixture to the bottom with same measuring table spoon. 1. Preheat oven to 350 F. In the bowl of electric mixer. 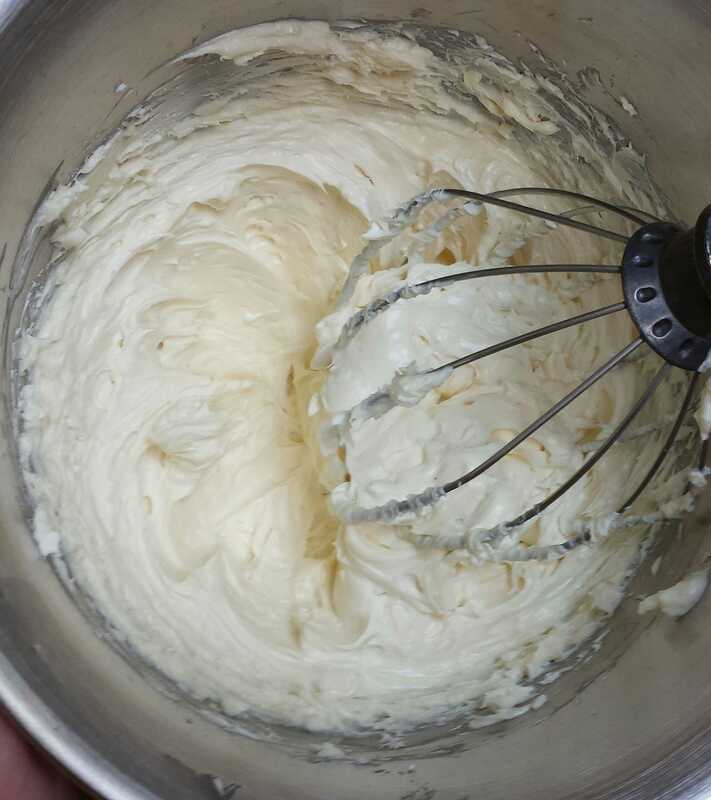 Add cream cheese, sugar, and vanilla. Beat on high for 2 minutes. 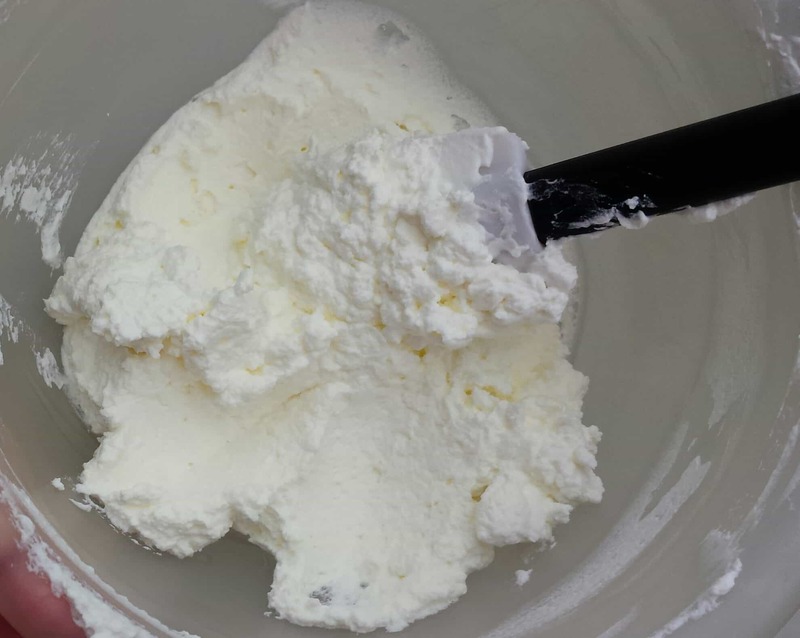 Scrape down the sides of mixer bowl with a spatula and beat it again on high for 3 minutes. 2. Reduce speed to medium and add one egg at the time (total of 3 eggs). Fill liners almost to the top. 3. Bake it in the oven for 18- 20 minutes. Remove from oven and let it cool completely. After the cheesecakes are cold, remove them from the mold by tearing the side of the foil. Place them on the plate for decorations. 1. Add one cup of heavy whipping cream into a small bowl. 2. Beat it on high for 2 minutes. 3. 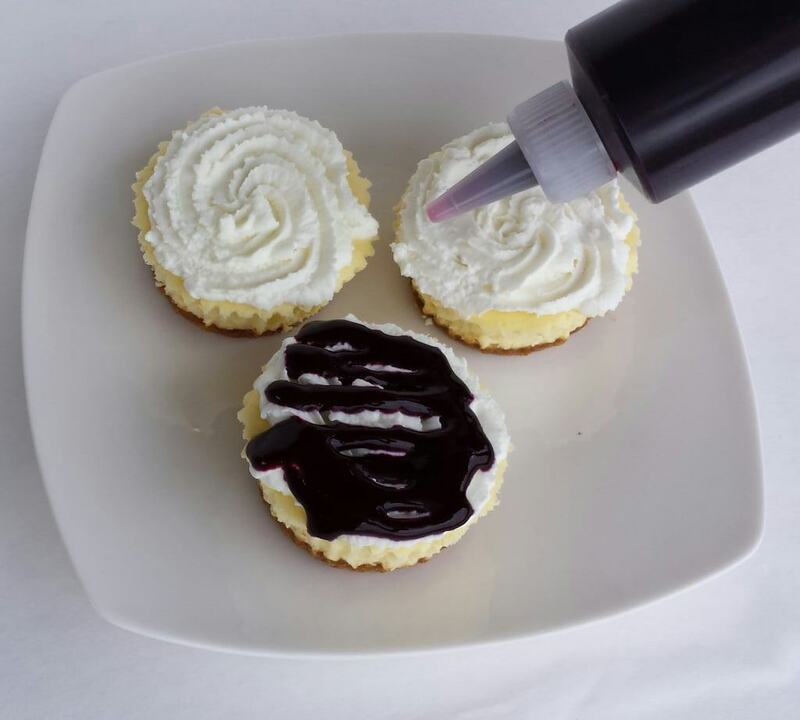 Place the cream into a piping bag with Wilton 106 attachment and line the cream on top of each cheesecake. 4. 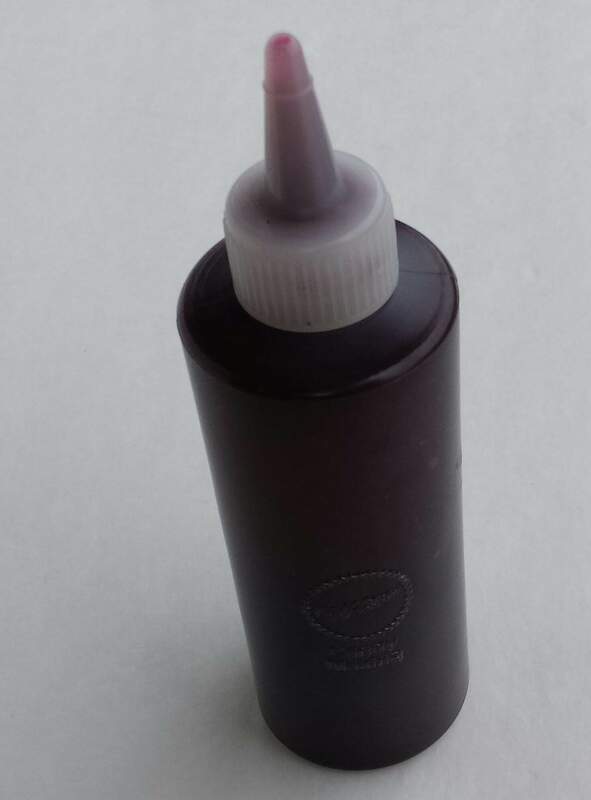 Pour the Blueberry Coulis Sauce into a Wilton Decorating Squeeze Bottle. 5. 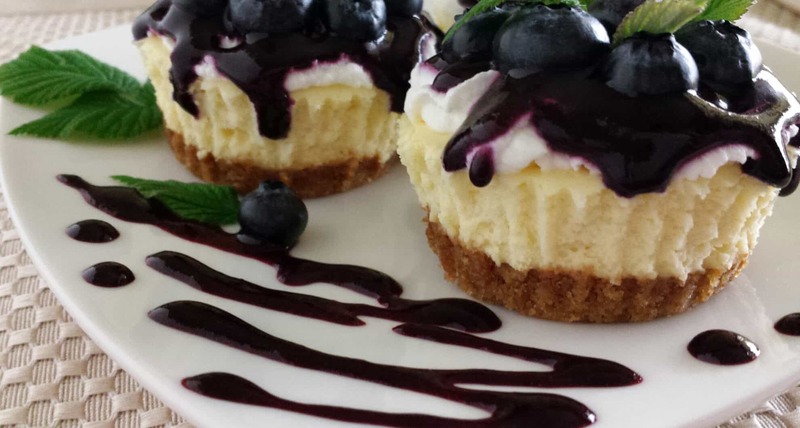 Drizzle the Blueberry Coulis Sauce on top of each cheesecake. 6. Garnish with some fresh gorgeous blueberries. 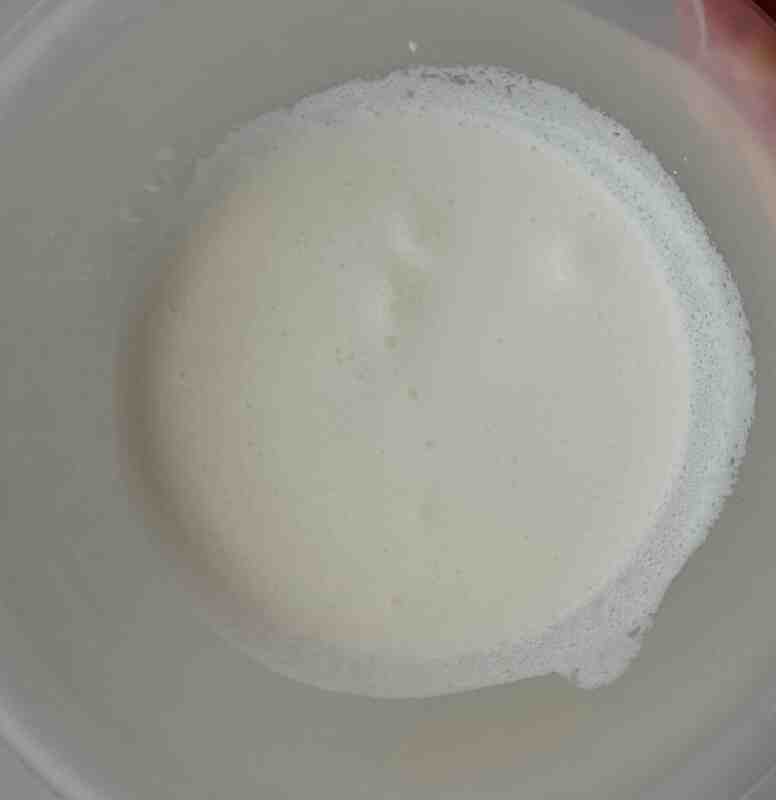 Refrigerate for 2 hours before serving. Enjoy!!! Nina said she is making this for Bellas birthday party 🙂 can’t wait to try them. They look absolutely scrumptious!!! Love the quality of this picture as well! Good job:)! 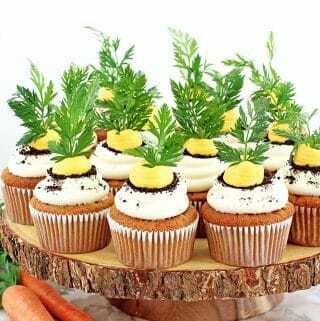 These look beautiful and delicious Valya! Love your pictures! Thanks Katya! I’ve been reading on how to improve your pictures from Tasty Food Photography e-Book. Check out the sidebar on my blog. Its also affiliate link. Thanks Dannii! I agree. Less calories intake. Sorry for late reply. I checked my spam folder and your comment was there. I just saw another recipe for mini cheesecakes and thought that I should make some, and then here you are with your amazing recipe! Pinning! 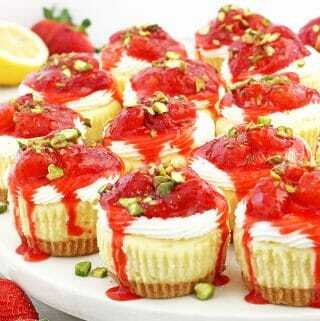 Those mini cheesecakes are beautiful! These sound delicious, and I love the blueberry sauce on there. So yummy! Hi Valya, Thanks for stopping by my blog! It led me to find your blog:) I’m looking forward to making some of your recipes. 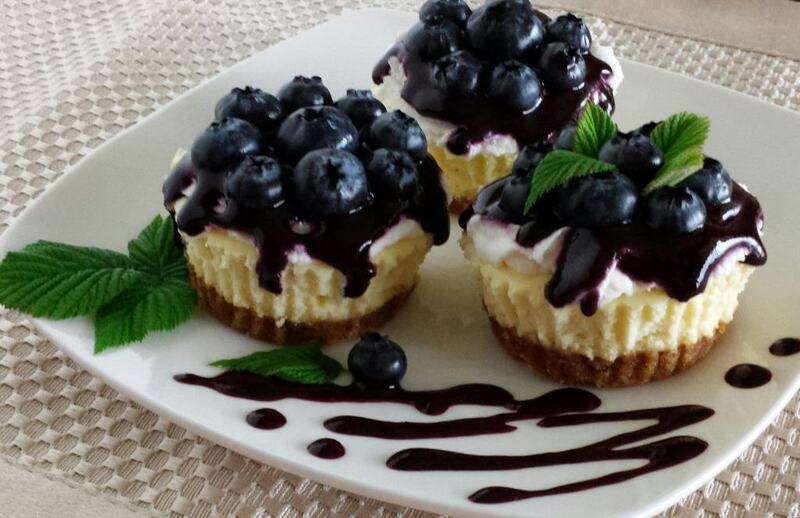 These cheesecakes look scrumptious! making second attempt of this delicious and gorgeous mini cheesecakes. Aren’t they tempting. I’m glad you like them. 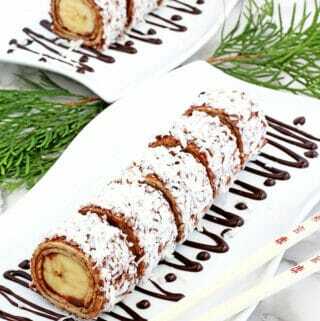 My daughter will be making them for this Sunday and that’s what she asked me too. I don’t know. We will experiment that and let you know. If you use foil they come out very easy leaving nice cupcake shape. 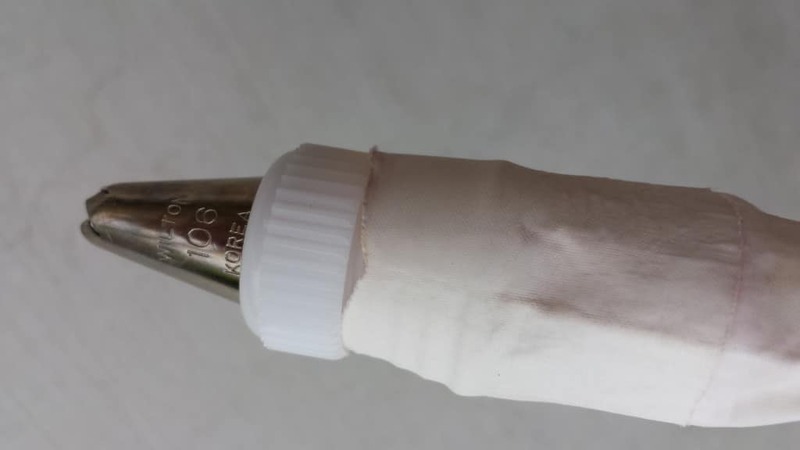 so did it work with paper mold instead of foil one? because I am planning to use paper one. The cheesecake may stick more to a paper molds and not peel off well. Give it a try and let me know how it went. Thank you for your comment. 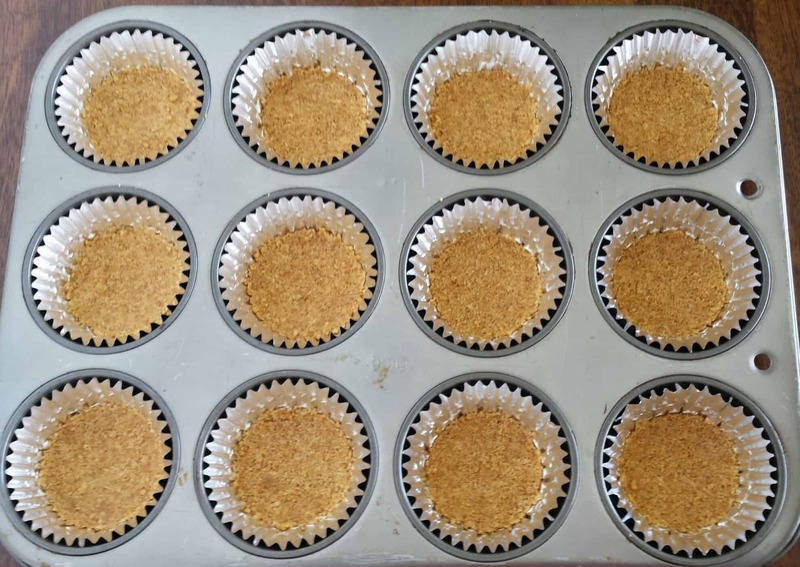 Are those regular-sized muffin tins? Or are they the mini ones? Those are regular size muffin molds. Thanks for asking Anna. Has anyone tried without the foil wrapper. 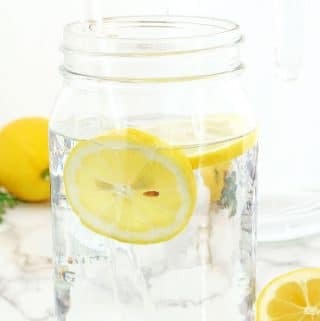 Making these right now and realized I don’t have any ? So I have to use paper. This was my first time making cheesecake (I personally do not like it) but my husband loves it so I made these for his birthday. He said they were the best, I don’t think anyone got a chance to have any as he ate them all lol. Great recipe thank you. this are absolutely B.E.U.T.F.U.L! I BET TASTY TOO! bin etwas irritiert, dass niemand die Sauce erwähnt…. 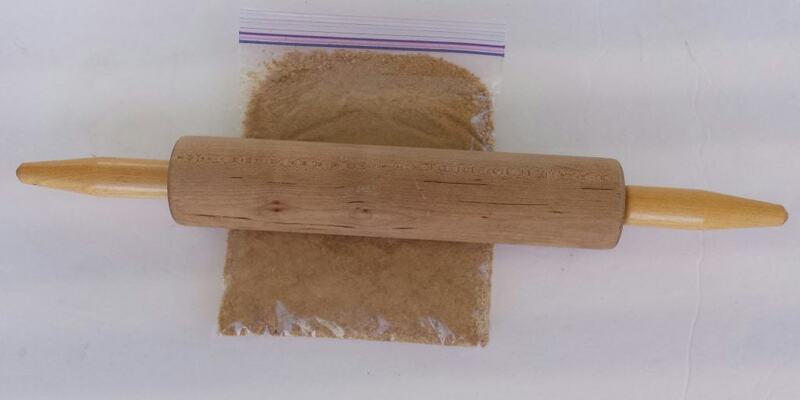 gut das ich das Rezept vorher noch in aller Ruhe mit den zugehörigen Zutaten lesen konnte, aber ich finde leider keinen Hinweis, wo und wie die Sauce zu machen ist…??? viell. kann man ja die Sauce, die bestimmt auch ein tragender Teil zum Gesamtkonzept ist, noch schnell nachreichen? I’m sorry, can you please recomment in English! I do not understand what it’s saying. Thanks. Absolutely! Just keep then refrigerated. Enjoy! Why did they cracked on top. ??? ?are they suppose to??? I am taking them to bible study tonite.. Yes, they are absolutely delicious! I made this 2 weeks ago and it was delicious. Followed every steps and ingredients. My family loved it! I will be making this for my son’s graduation party. I’m glad to hear that everyone loved it! We love it very much too! BTW, made them for last Sunday’s dessert 😀 Gongrats on your son’s graduation! ? 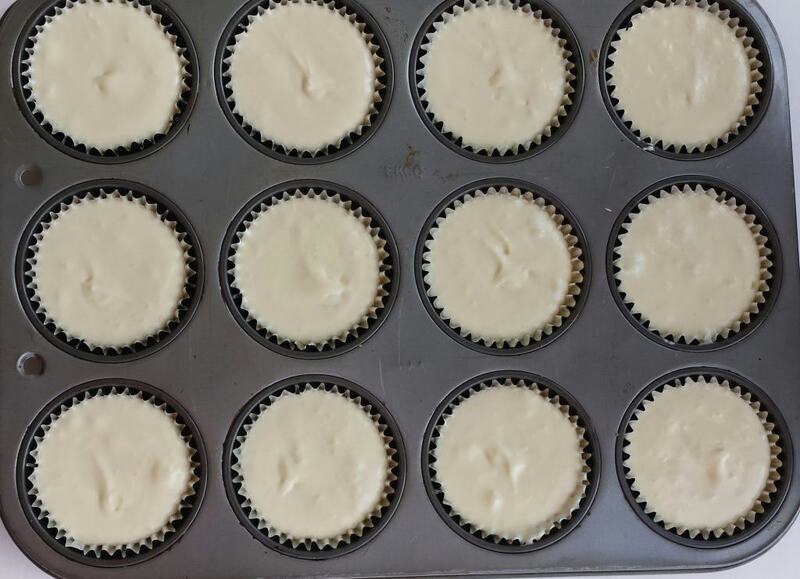 I would like to make it in a pan instead of cupcakes, is there anything that I should do or change the measurements? Thanks! You would need to use about 8 or 9 inch spring form pan. Cover the bottom of the pan with foil, place cheesecake onto a baking pan ( I use turkey pan), transfer into preheat oven, then pour boiling hot water (use tea kettle) into a pan little less then half way. Bake in the water bath for about an hour at 300 F. Then turn the oven off, open oven door just a little bit for the heat to escape, and let it cool in the oven for about 2 to 3 hours. 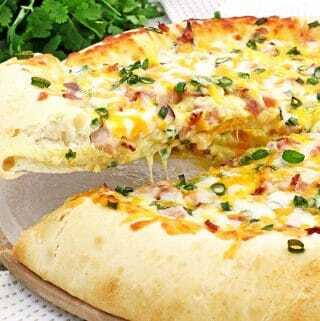 Then remove from the oven refrigerate overnight or 6 – 8 hours before serving. This way the cheesecake will hold it’s shape and not crack. I will have to post a separate recipe for it do to so many requests. I hope this helps. And I would love to know how it turn out for you (share a picture ?). Hi, can these be frozen? Would you defrost in the fridge? Wanting to make desserts ahead of a function and these next perfect! These cheesecakes it self may be frozen, but not the cream or coulis sauce. Thaw cheesecakes in the fridge for at least 6 hours then decorate them with cream, sauce and fresh blueberries. These were so delicious! Family started eating them as soon as they cooled down! Didn’t even have time to properly decorate the first half. These are my favorite! Let me know how you like them.